New York Times Bestseller Wall Street Journal Bestseller Everything you thought you knew about becoming a CEO is wrong. You must graduate from an elite college or business school. In fact, only 7 percent of the CEOs of today's companies went to a top school--and 8 percent didn't graduate from college at all. Never put a foot wrong. In fact, people who have become CEOs have on average had five to seven career setbacks on their way to the top. 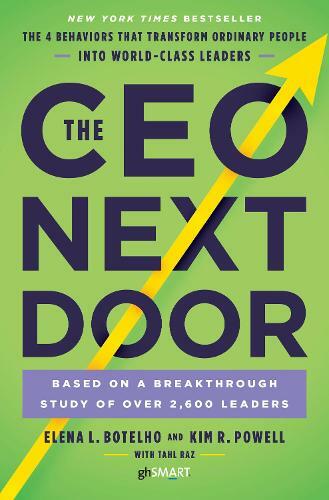 Drawing on the biggest dataset of CEOs in the world -- in-depth analysis of 2,600 leaders, drawn from a database of 17,000 CEOs, as well as 13,000 hours of interviews -- The CEO Next Door is crammed full of myth-busting and counter-intuitive insights in what it really takes to get ahead. Discover the way actual CEOs of top companies think and behave, and the kind of traits to develop if you want to make your ambitions a reality and take your career right to the top.